Deepen your sense of the past at sights like Spaso-Preobrazhenskiy Cathedral and Akkerman Fortress. Shustov Cognac Winery Museum and Arcadia district are good opportunities to explore the local culture. Explore the numerous day-trip ideas around Odessa: Central City Beach (in Illichivsk) and Alexandr Barracks (in Bilhorod-Dnistrovskyi). 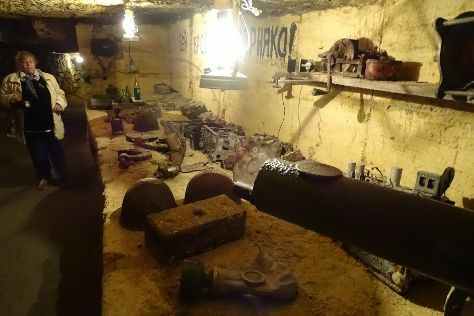 There's lots more to do: stop by Shabo Wine Cultural Center, appreciate the history behind Duke de Richelieu monument, tour the pleasant surroundings at City Garden, and Head underground at Catacombs of Odessa. To see reviews, traveler tips, other places to visit, and tourist information, read our Odessa tour planner. Use the Route module to find suitable travel options from Abu Dhabi, United Arab Emirates to Odessa. The time zone difference moving from Gulf Standard Time to Eastern European Time is minus 2 hours. Prepare for colder weather when traveling from Abu Dhabi in October: high temperatures in Odessa hover around 17°C and lows are around 8°C. Finish up your sightseeing early on the 19th (Wed) so you can travel back home.